It’s more off than on. I was going to write this post and show these earlier, before the hat was finished. But I was on a roll and decided to keep on going. Both of these patterns came from ravelry. The booties are the result of a search for a pattern for booties that would stay on a baby’s foot. The pattern Hodge is a free download. It’s a very quick and easy knit using left over sock yarn, of which I have an abundance. 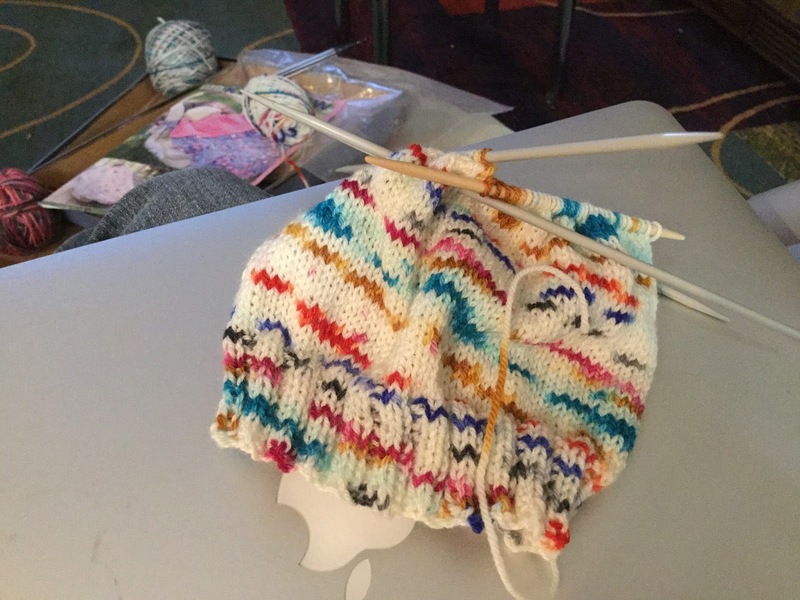 The hat is also a free ravelry download called Newborn Baby’s Striped Hat. 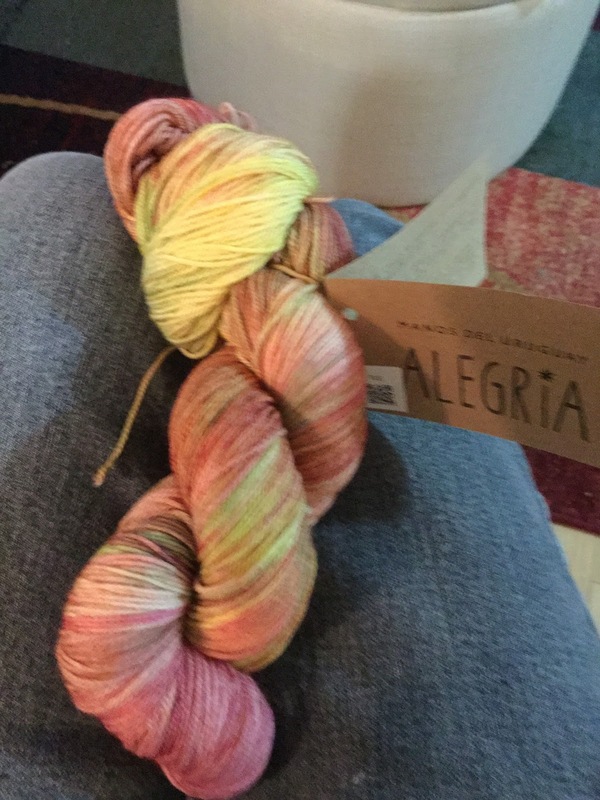 The design called for yarn colour changes. But since I have an abundance of leftover self striping sock yarn, that’s what I used. 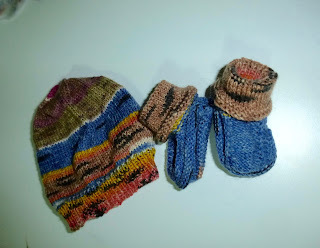 I think there will be a pair of little mitts to go with these, just for a little bit more fun.This is actually the second hat I’ve finished in the last couple of weeks. 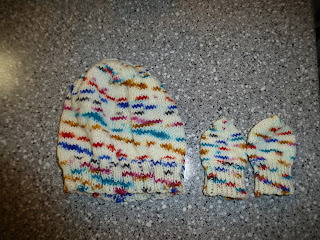 The first one is made out of the same hat pattern. It has a pair of tiny mitts to go with it. I didn’t have enough of this yarn left to do the booties, as well. Little Abrielle will be all warm and cozy when she gets here in January. I’m a day late, but I’ll still link up to Judy’s On the Needles. It’s supposed to be on Monday, not Tuesday, but last evening was spent watching the election results come in, rather than writing up a blog post. So I’ll do it today instead. I’ve got a couple of things going on up there. A finish, a start and a work in progress. 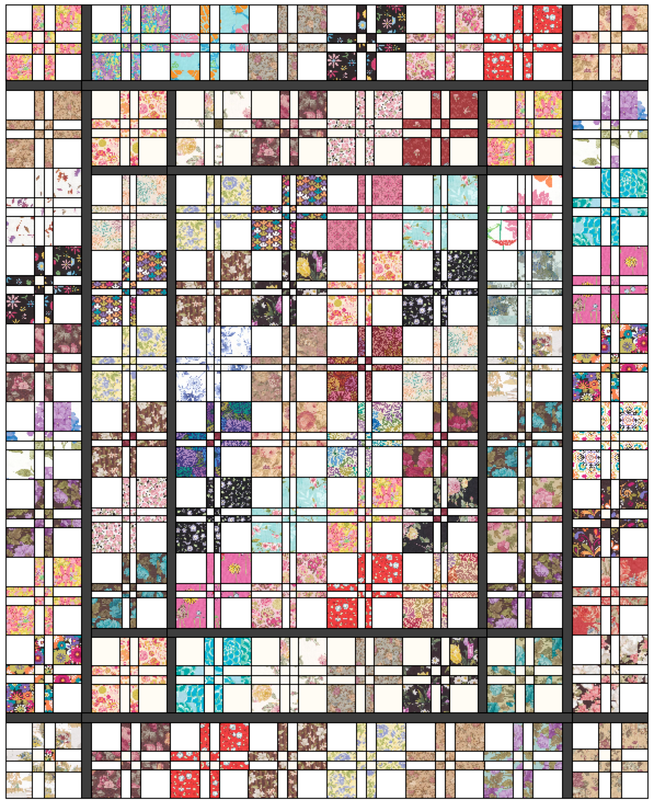 The finish is a very modern, totally out of my box quilt, from a pattern called Black Tie Affair, found in a Quiltmaker magazine. I can’t remember the exact issue date, and I’m too lazy to go upstairs and get it.This one is going into the waiting-to-be-quilted pile. 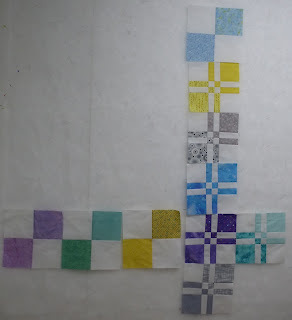 The work in progress I’ve been playing around with is more of the large scale floral Disappearing Four Patch blocks that Jannette and I are doing. Somewhere along the line I have managed to change the size of the cuts not once, but twice. So there are three different sizes in this quilt. These are the smallest with the cuts finishing at 3/4 inches. 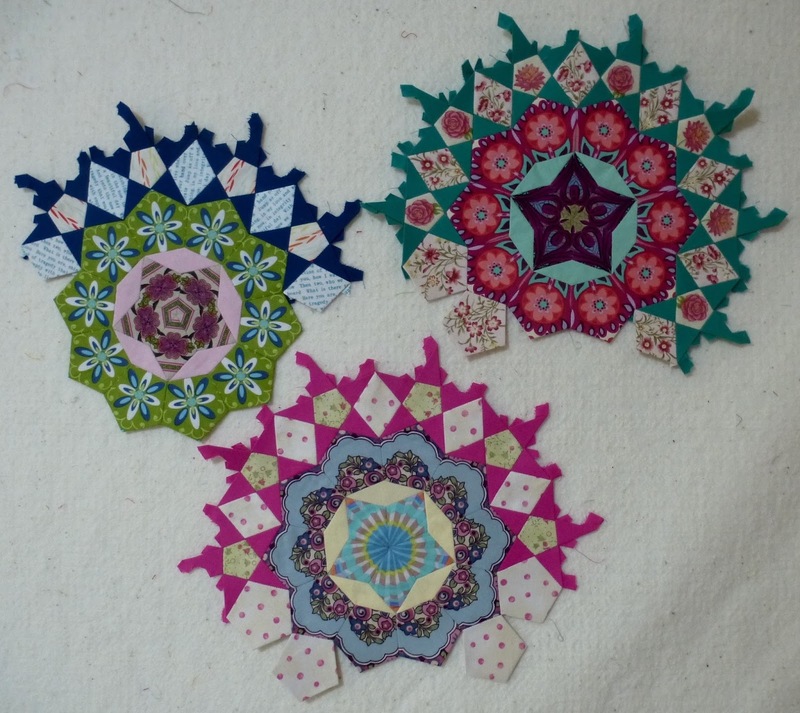 These are going into the centre of the quilt. 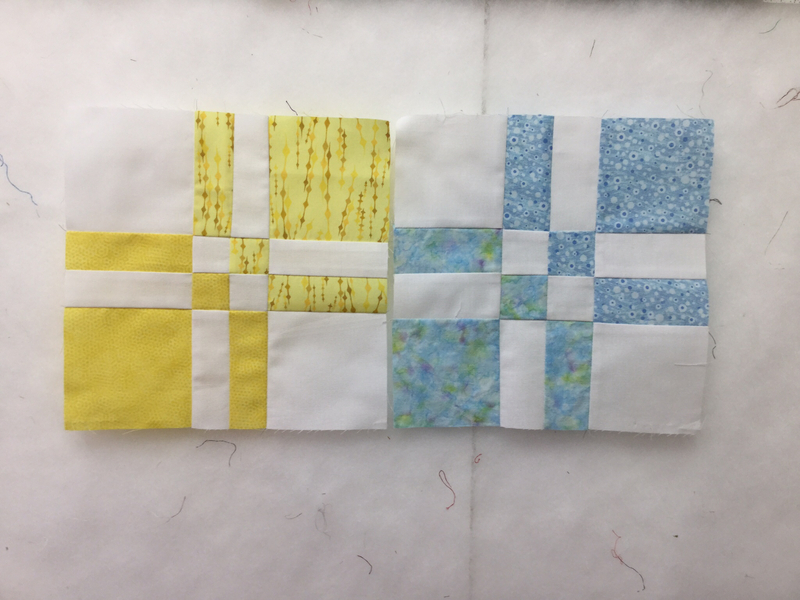 I did some playing around in Electric Quilt to see if I could come up with a design that would separate out all the different sizes, and I’ve shared it with Jannette, since she was also effected by the change in sizes. This is what I’ve come up with. The different sizes are separated out by the dark sashes, which also act as a really neat design element. 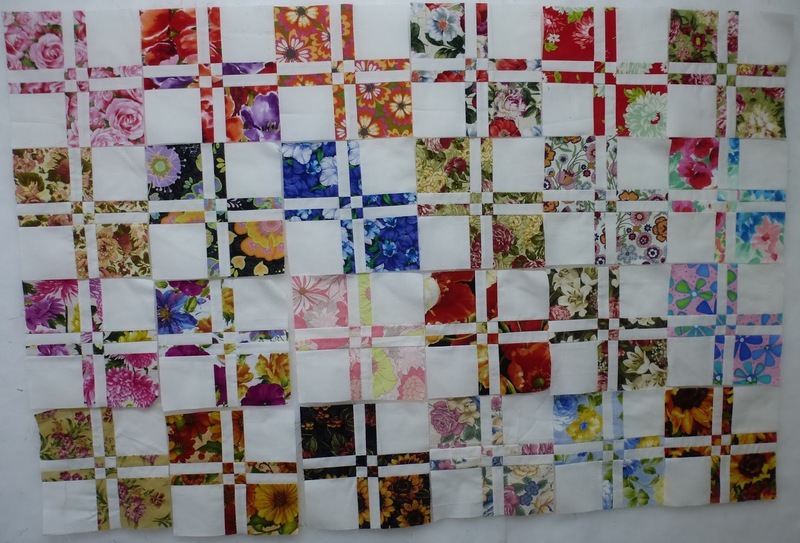 The new start is another baby quilt for our grand daughter, expected in January. It is also Disappearing Four Patches, set in a more modern, minimalist way. 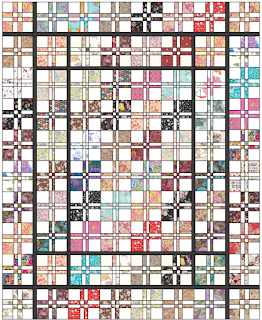 I originally saw the quilt here, and really liked the layout. These are the colours that Becca has chosen. It’s not going to take long to finish this one. Earlier today I loaded a new customer quilt and got it about halfway finished. Here’s a look at it. 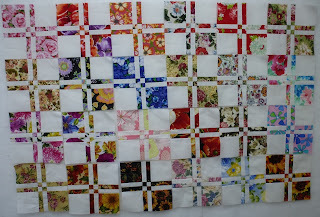 And that’s been my day, full of fun quilty stuff. 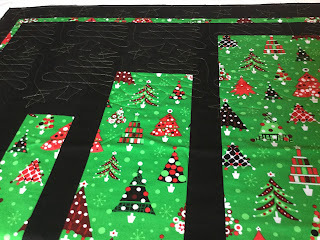 I’m going to link up with Connie’s Linky Tuesday and the Canadian sharing site the Needles and Thread Network for their Work in progress Wednesday. Again, it’s been two weeks since my last report...... sounds like I should be going to confession, doesn’t it? 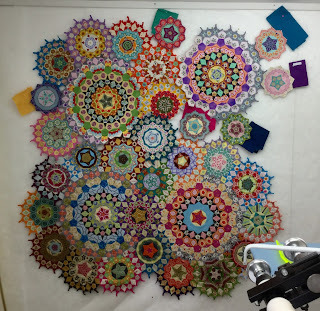 I’ve gotten quite a bit more done on La Passacaglia. Three more rosettes are now done, which means only two more to go!! Can we have a woohoo, hurray??? 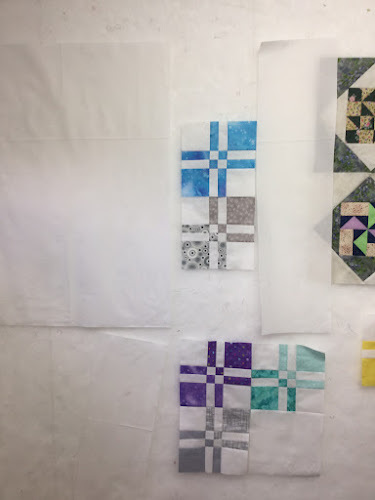 I’ve taken the whole project down from my upstairs design wall, and brought it downstairs so I can lay out the parts that need to be sewn together. I have better access to them down here, and I can now take them directly off the wall and make sure they get sewn in where they should. 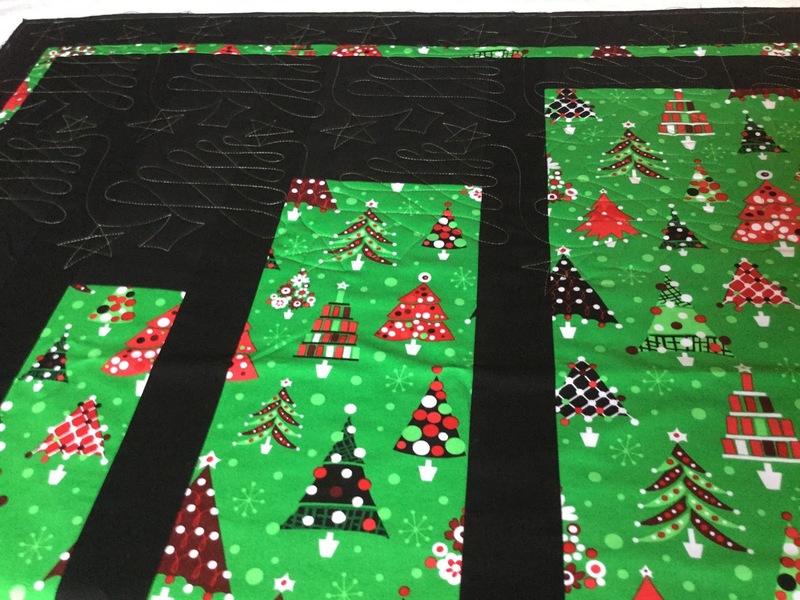 I am thinking at this point that I’ll keep the top and bottom halves of the project separate as I sew in the white edging pieces, just to keep the bulk and weight more manageable. I must confess that I am getting to the point on this project that I am ready to have it done and move onto something else. But I am determined to get it done, so I will persevere. One thing I am having no problem doing at all this year is adding to my stash. It’s so much fun to get fabrics in the mail, regardless of what it does to my stash numbers. The new and fresh stuff is great to have come in. Somehow, I think getting into net stash busted numbers this year is just a pipe dream, at this point. But, since I only do this for fun and curiosity, rather than as a keep track to make sure I use more than I buy thing, it doesn’t really matter. 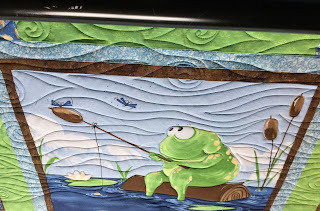 I’m Linking up to Kathy’s Slow Sunday Stitching and Angie’s WIPs Be Gone. Then I’ll have to make a decision...... do I start sewing it all together, or do I do the last two rosettes? And it is soooooooo cute. I originally bought this fabric before our grandson Avery was born. 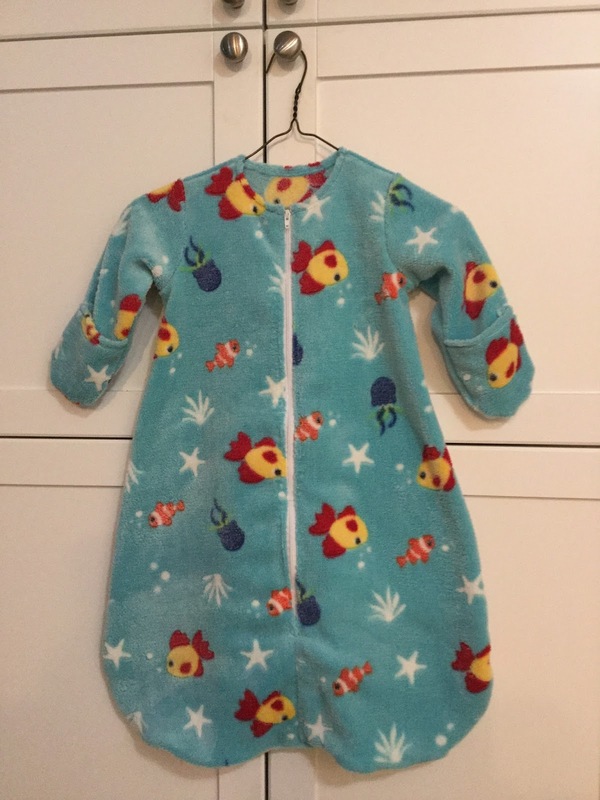 At the time, over four years ago now, the plan was for his nursery to decorated with a tropical fish type theme, and I thought this stuff would make a perfect sleeper for him to fit right in with the theme. Four and a half years later and I think I might have run out of time to make a sleeper for him. However, fabric never goes bad or goes to waste. A little baby girl will like it just as well. As well as finishing this, I've put a few more stitches into the hat I was working on yesterday, and have it almost finished. Another half hour should do it, then I can start something else. I loaded a new customer quilt on Thursday and got it half finished. It is such a cute panel, with some piecing added to it around the outside. I’m doing a water effect in the background areas of it, and outlining the figures, mostly frogs and fish. I worked on that quilt until about 5 pm yesterday, and then came down to play with yarn. Ever since we found out on Wednesday that our coming grandchild is going to be a grand daughter, I’ve been having all kinds of fun planning and playing with baby girl stuff. I’ve got all kinds of sock yarn left over from making socks, for starters. So I found a pattern on Ravelry for a basic new born sized hat. I’m to the point of starting to make the decreases for the top part of the hat, so it shouldn’t take too much longer to finish. I started another sleep sac, today, but it’s upstairs, and I’m too lazy to go up and get it for pictures. I’ll post it when it’s finished..... maybe tomorrow. I already know what I want to do up next. These cute little booties, Crocodile Stitch Booties, using this yarn. And then there just might be this hat to go with it, or maybe this one. Who knows, maybe both. It depends on how fast the crochet goes, compared to the knitting. All I do know is I’m having all kinds of wonderful fun! I’m liking up to Judy’s On the Needles. And then I’m going to knit. In keeping with the intent stated yesterday to do shorter posts more frequently, that’s what I’m doing. First off, today got a late start, due to not sleeping last night. When I got up. there was a text message waiting for me from Matt. They had an ultrasound today, so I figured they had news....... and they did... we’re having a grand daughter!! Woohoo! That has been my not-so-secret hope! Let the fun little baby girl sewing and knitting begin. 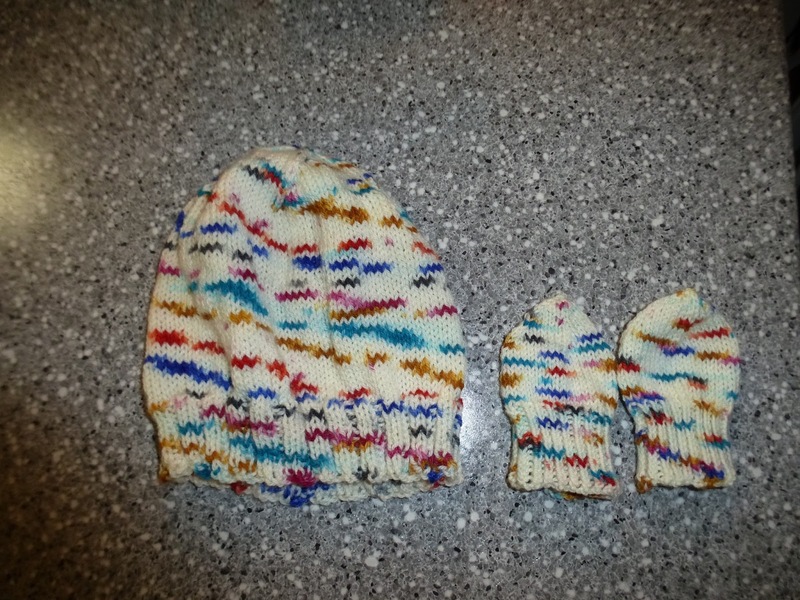 Having found that out, I promptly went onto Ravelry and did a little baby hat research. There are so many cute choices, that I’m going to have a hard time choosing. In keeping with this being a short and quick post, I haven’t the time to actually go back to Ravelry and get some of the pictures to show here. I’ve been working on a customer quilt today, once I dragged myself away from all the fun kitty stuff. This is it, here. It’s full of fun and bright dots and stripes and plaids. She wanted something curvy and feminine, so I’m doing ribbon swirls. And now that my sit down break is over, and also because I’m expecting someone who is going to be dropping off a quilt, I must end this here. What a week! It’s been crazy! I worked like mad on Tuesday and Wednesday last week, because I knew I was going to the dentist on Thursday to have at least one tooth yanked out, maybe two. Turned out to be just the one...... whew! But, because I’m such a coward when it comes to the dentist, I opt for the IV sedation, which meant I was out for the count all day Thursday. And then, because it was really sore, and I didn’t sleep at all well Thursday night, I was mostly out for the count on Friday. 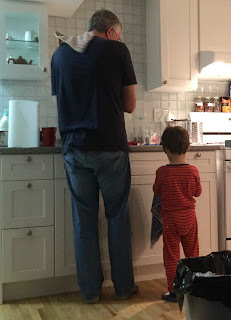 Thankfully, I have a husband who cooks, because Friday we did up the turkey and stuffing for our dinner on Saturday. Actually, I should say that Scott did the cooking on Friday. All I did was add the seasoning to the stuffing, since it’s a family thing that came from my side of the family, and I seem to be the only one who knows how it goes. I’ve tried to write the recipe down, but since I don’t measure things, it’s really hard to write it down, for the seasonings, at least. The rest of it they know how to do. Our wonderful little Avery came down to visit on the weekend. Noel drove 3 1/2 hours up to get him, then 3 1/2 hours back here on Friday. They arrived shortly after 11 pm on Friday. I figured Avery would be so tired, he’d have to be carried in right to bed, but he was awake when they got here. 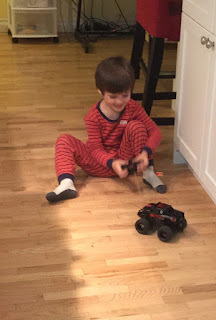 I got a short cuddle and rocking in the rocking chair with him, before they headed up to bed about midnight. Saturday, we played all day, as well as had our dinner. We had so much fun, I only got one picture, since we were too busy doing to stop and take a picture of what we were doing. 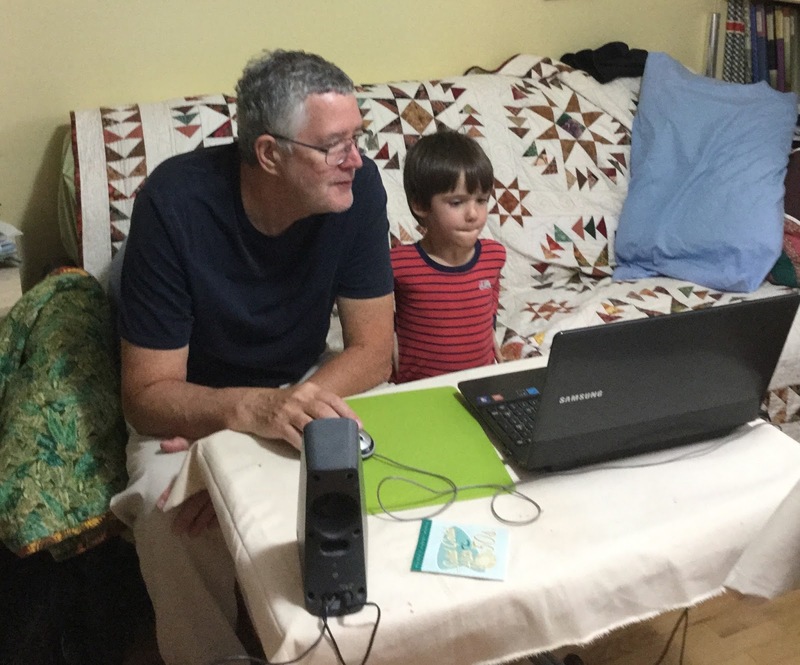 Scott has a trains program on his computer, and they both love playing it. I did a little better getting pictures on Sunday. Scott and Avery were playing with remote control cars. And then a little later, Avery helped Grampy dry some dishes. I love watching the two of them interact. Scott is so good and so patient with him. He’s a fabulous Grampy. Noel did the 3 1/2 hours to take Avery home and then the 3 1/2 hours back to his place again on Sunday. It’s a lot of driving, but it was so very worth it. This was his first weekend trip down to see us, and I wasn’t 100% sure how it would go, but there weren’t any problems at all. Yesterday was a recovery day, after the weekend. 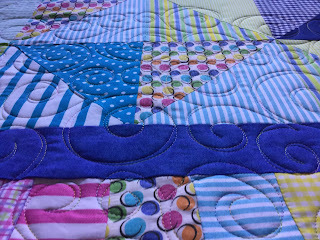 A little netflix, a little hand stitching, and a lot of blog writing for the London Friendship Quilters’ Blog. I’m doing the blog for this year and next as well. I’m doing a free sampler presented on the blog, so I wanted to get a fair way ahead on writing up the blocks to prevent ending up feeling pressured. There are posts done for it now up until January. You can go here and take a look if you’re interested. The blocks are being posted on the first and third Thursday of the month. And that takes us up to today, which was spent working. I finished up a customer quilt and loaded and started another. This evening,I’m heading out to Gail’s for a couple of hours of visiting and hand stitching. Whew..... I’m tired out again, just writing about it all! I’m finding that doing the two blogs, this is the one that is getting less attention. 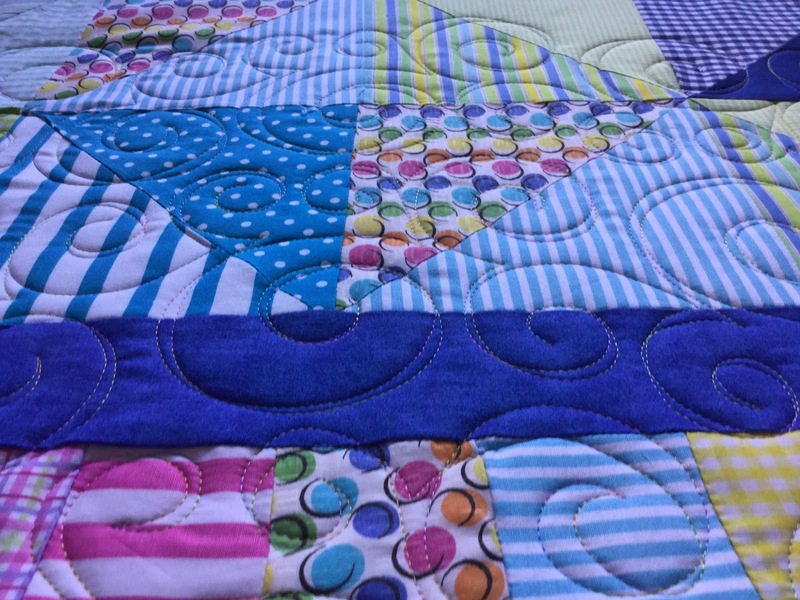 I might not get back to doing posts about individual customer quilts for the next while. Instead, I’ll try to do short snippets of what I’m up to, hopefully more frequently, with just peaks at the quilting as it’s happening, rather than pictures of the entire quilt. Anyway, time to go get ready to head out for a couple of hours of quilty friend time. I’ll be taking one of the last three rosettes for La Passacaglia. 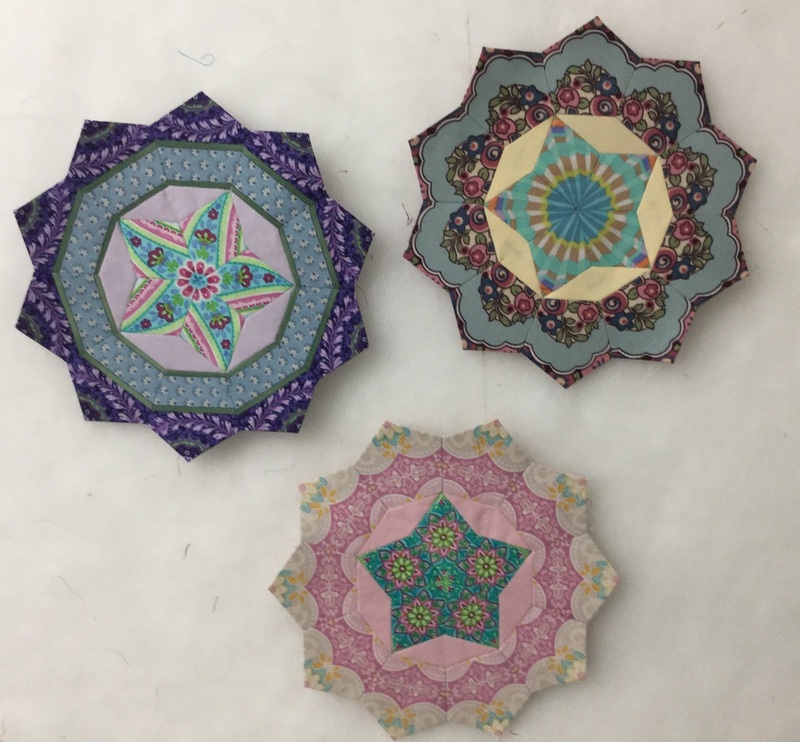 I did a lot more stitching on La Passacaglia this week, and finished up three more rosette centres. 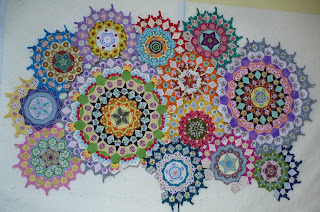 Then I did some arranging on the wall to find their final spots, and decided on the colours for their star points. This is becoming harder as the project gets closer to being finished, trying to keep the colours balanced, without one colour being to close to itself or too overwhelming. As of now, I think I have all the rosettes needed for the design as presented in the book. There are a few spots where I would like to add some more. So it could be counted as almost done, but I think there might be 4 or five more yet that I want to do. I'll know more when all these have their stars added to them and then I think I'll sew the whole thing together before I decide for sure whether I'm making more. The colours in the picture of the whole thing are off, and I don't seem to be able to get it true to real life, where it is lighter and brighter, especially the bottom left corner. It's a really grey day outside, which might have something to do with it. Once I get the stars on these rosettes, I can count them as done, and the stash for them used. 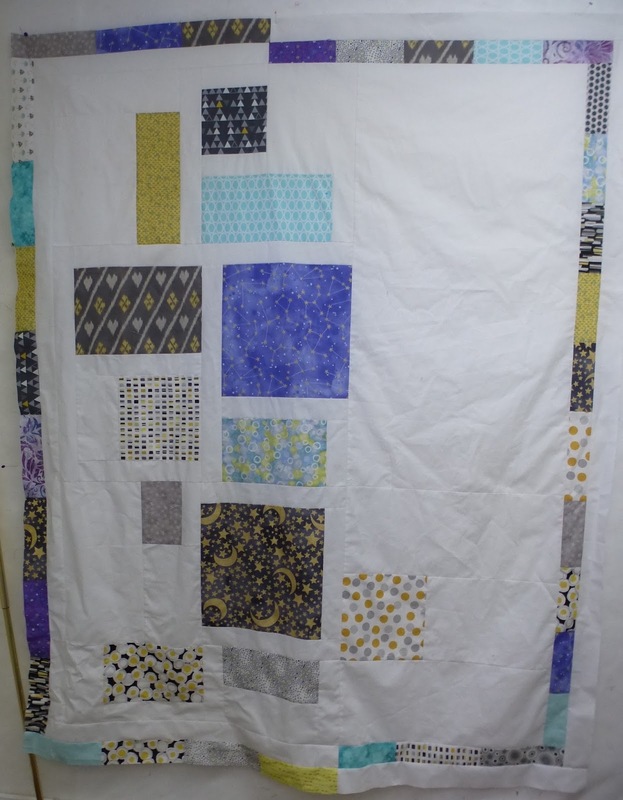 In the meantime, I did put together a very fast and easy baby/throw quilt last week, so I can count the yardage for that. I was out at Lens Mills yesterday, picking up some zippers and other odds and ends that I needed for the baby sewing I'm doing, and a couple of pieces of fabric usage;e for La Passacaglia added themselves to the cart, so there's a small added number. 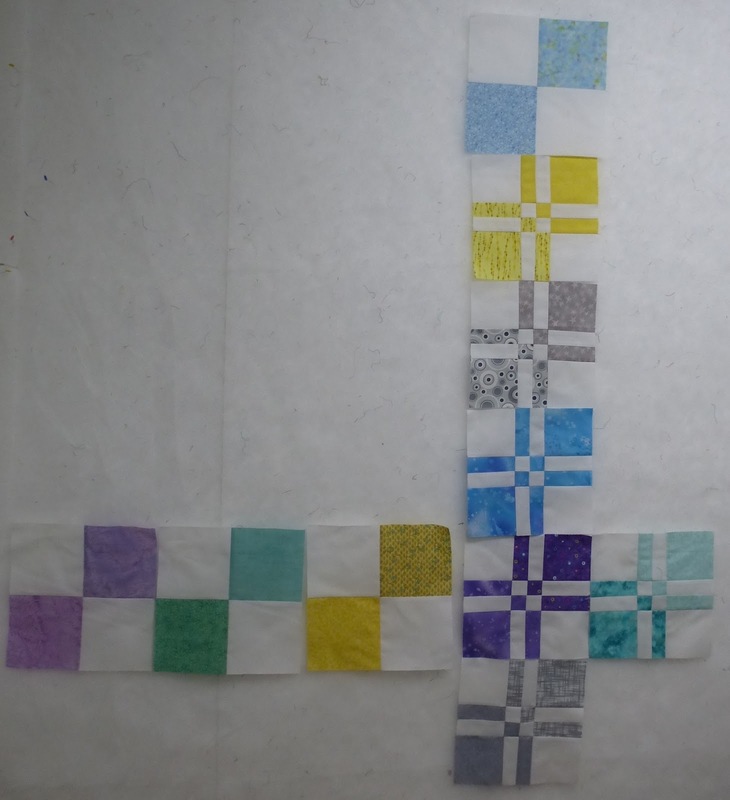 I'm going to link up to Judy's Fabric Report and Kathy's Slow Sunday Stitching. After that, you'll find me making stars, and watching netflix. I went out yesterday and bought myself a new machine. I've been dithering about whether I need a serger for a long time. The argument being, that I have an overcast stitch on my regular machine, so why would I need a separate machine for it. I've been doing research, and finally decided yesterday to do it. I brought it home, set it up, and got out a bunch of flannelette that Becca bought for receiving blankets. I was originally planning on either hemming them, or putting some sort of binding around the edges. But I did them up on the serger instead. All I can say is, how did I do so much sewing for so long without one! It is the fastest, most amazing thing! I wish now that I'd had one over four years ago when I was making all those diapers for Avery. It would have made that whole process so much faster. I didn't get an expensive one with lots of bells and whistles, just a basic Janome. Since it came home yesterday, I've done seven large receiving blankets, these are just three of them, and a bunting bag, size small, for the yet-to-be-born grand baby. This is actually fleece that was left over from making pyjamas for Avery last year. So it is more or less bonus fabric. And there is more where this came from. I was going to start another one of these, but then I decided to sit down and share about it, before starting a new one. However, now that I look at the time, I think I'll put something on netflix, and work on La Passacaglia for the rest of the evening.